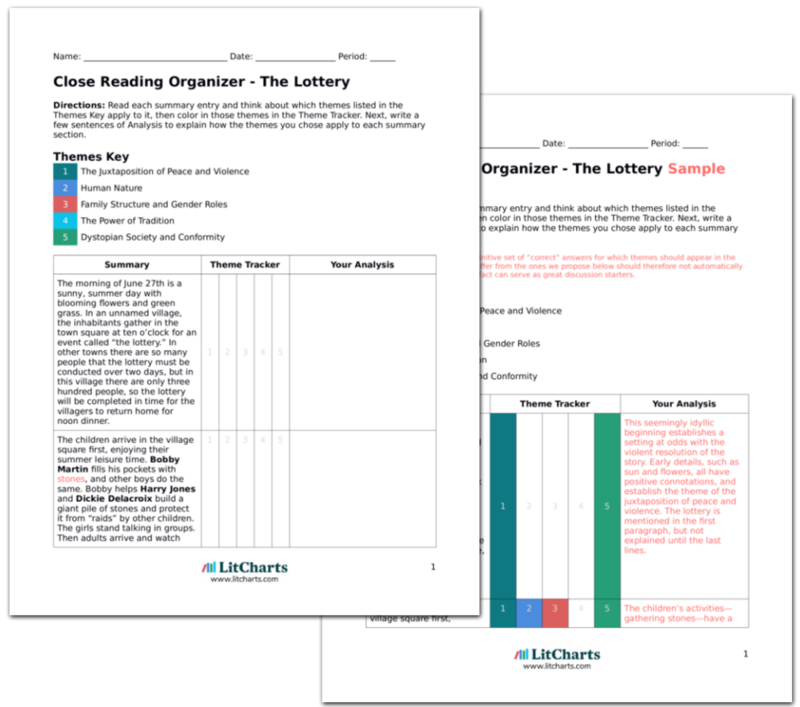 Instant downloads of all 946 LitChart PDFs (including The Lottery). 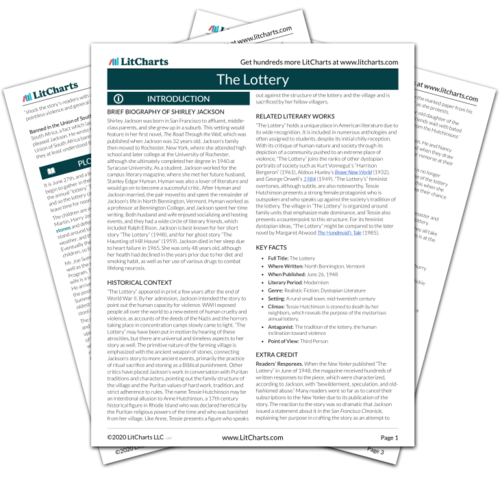 Welcome to the LitCharts study guide on Shirley Jackson's The Lottery. Created by the original team behind SparkNotes, LitCharts are the world's best literature guides. A concise biography of Shirley Jackson plus historical and literary context for The Lottery. A quick-reference summary: The Lottery on a single page. In-depth summary and analysis of every of The Lottery. Visual theme-tracking, too. Explanations, analysis, and visualizations of The Lottery's themes. The Lottery's important quotes, sortable by theme, character, or . Description, analysis, and timelines for The Lottery's characters. Explanations of The Lottery's symbols, and tracking of where they appear. An interactive data visualization of The Lottery's plot and themes. Shirley Jackson was born in San Francisco to affluent, middle-class parents, and she grew up in a suburb. This setting would feature in her first novel, The Road Through the Wall, which was published when Jackson was 32 years old. Jackson’s family then moved to Rochester, New York, where she attended high school and later college at the University of Rochester, although she ultimately completed her degree in 1940 at Syracuse University. As a student, Jackson worked for the campus literary magazine, where she met her future husband, Stanley Edgar Hyman. Hyman was also a lover of literature and would go on to become a successful critic. After Hyman and Jackson married, the pair moved to and spent the remainder of Jackson’s life in North Bennington, Vermont. Hyman worked as a professor at Bennington College, and Jackson spent her time writing. Both husband and wife enjoyed socializing and hosting events, and they had a wide circle of literary friends, which included Ralph Ellison. Jackson is best known for her short story “The Lottery” (1948), and for her ghost story “The Haunting of Hill House” (1959). Jackson died in her sleep due to heart failure in 1965. She was only 48 years old, although her health had declined in the years prior due to her diet and smoking habit, as well as her use of various drugs to combat lifelong neurosis. 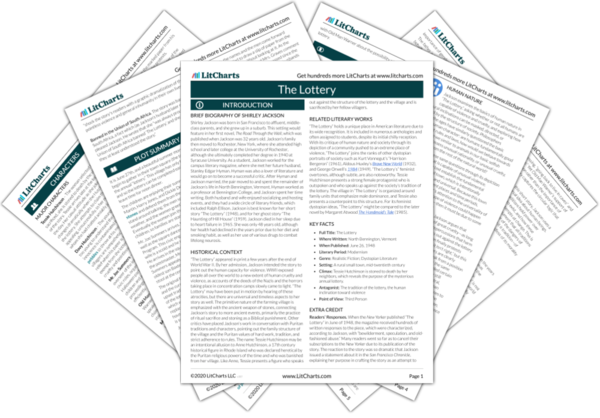 Get the entire The Lottery LitChart as a printable PDF. “The Lottery” appeared in print a few years after the end of World War II. By her admission, Jackson intended the story to point out the human capacity for violence. WWII exposed people all over the world to a new extent of human cruelty and violence, as accounts of the deeds of the Nazis and the horrors taking place in concentration camps slowly came to light. ”The Lottery” may have been put in motion by hearing of these atrocities, but there are universal and timeless aspects to her story as well. The primitive nature of the farming village is emphasized with the ancient weapon of stones, connecting Jackson’s story to more ancient events, primarily the practice of ritual sacrifice and stoning as a Biblical punishment. Other critics have placed Jackson’s work in conversation with Puritan traditions and characters, pointing out the family structure of the village and the Puritan values of hard work, tradition, and strict adherence to rules. The name Tessie Hutchinson may be an intentional allusion to Anne Hutchinson, a 17th century historical figure in Rhode Island who was declared heretical by the Puritan religious powers of the time and who was banished from her village. Like Anne, Tessie presents a figure who speaks out against the structure of the lottery and the village and is sacrificed by her fellow villagers. “The Lottery” holds a unique place in American literature due to its wide recognition. It is included in numerous anthologies and often assigned to students, despite its initial chilly reception. With its critique of human nature and society through its depiction of a community pushed to an extreme place of violence, “The Lottery” joins the ranks of other dystopian portraits of society such as Kurt Vonnegut’s “Harrison Bergeron” (1961), Aldous Huxley’s Brave New World (1932), and George Orwell’s 1984 (1949). “The Lottery’s” feminist overtones, although subtle, are also noteworthy. Tessie Hutchinson presents a strong female protagonist who is outspoken and who speaks up against the society’s tradition of the lottery. The village in “The Lottery” is organized around family units that emphasize male dominance, and Tessie also presents a counterpoint to this structure. For its feminist dystopian ideas, “The Lottery” might be compared to the later novel by Margaret Atwood The Handmaid’s Tale (1985). Climax: Tessie Hutchinson is stoned to death by her neighbors, which reveals the purpose of the mysterious annual lottery. Champlin, Nikola. "The Lottery." LitCharts. LitCharts LLC, 2 Dec 2015. Web. 24 Apr 2019. Champlin, Nikola. "The Lottery." LitCharts LLC, December 2, 2015. Retrieved April 24, 2019. https://www.litcharts.com/lit/the-lottery.